Man’s best friend is a whole lot more talented than you could have ever imagined—dog surfing is a sport that takes places all along the coastal United States. Let us repeat that—dog surfing! Who would have ever known that canines could have such a hang loose attitude? 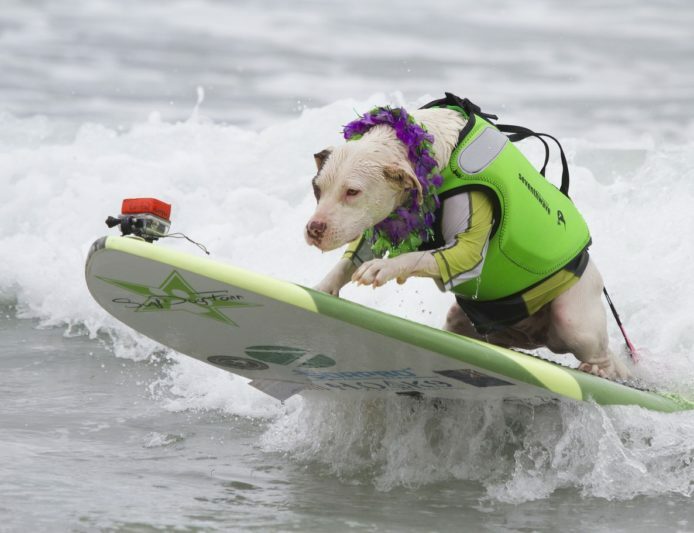 Not only do they surf, but they participate in dog surfing competitions too. In the 1930s, a terrier named Night Hawk gained attention in Hawaii for riding on the front of his owner’s wooden surfboard. In 1944, National Geographic published a full page photo of a dog named “Rusty” catching a wave. The sport picked back up in the 1970s and 1980s in San Diego and most recently, competitions have popped up across Florida and California. Competitions are judged based on canine “certainty” on the board, wave size, and ride length—but those aren’t the only tricks these dogs can do. 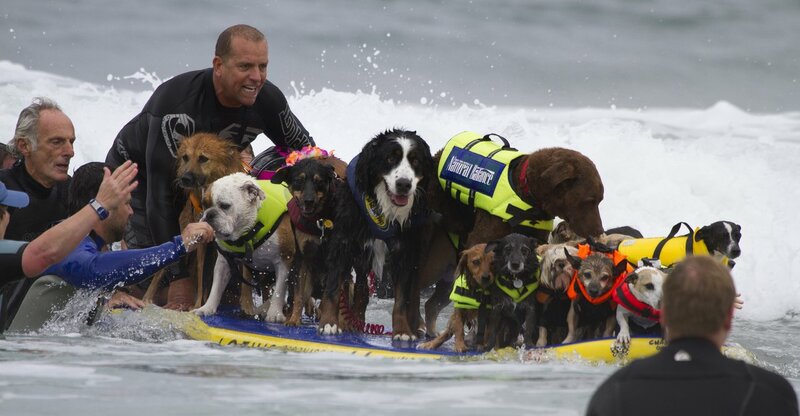 In 2012, a Guinness World Record was broken when 18 dogs rode on one surfboard simultaneously in Imperial Beach, CA. 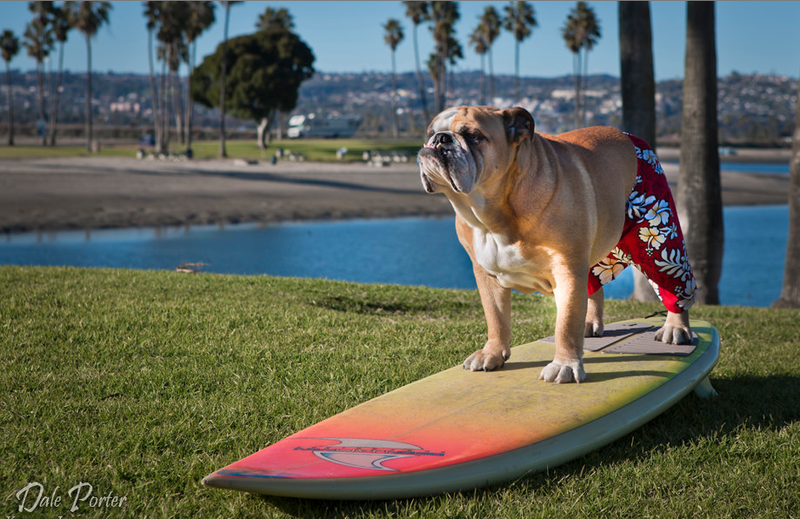 The Loews Coronado Bay Resort Surf Dog Competition (now known as “Unleashed by Petco”) at Imperial Beach is considered the largest in the United States. Over 50 dogs participated in the first one in 2006 and it has been growing ever since. Both single and tandem entries are options in this competition, allowing dogs the possibility to be accompanied by another furry friend or their human counterpart. Other famous competitions happen in Huntington Beach, California and Jupiter, Florida. 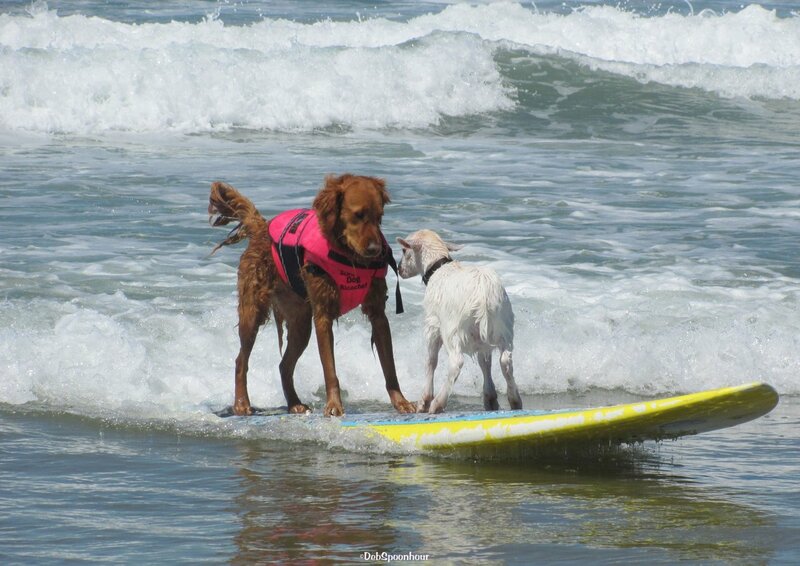 Just like any sport, dog surfing has its superstars! Check out this video to see just what we’re talking about. Ricochet is a world-famous surfing golden retriever. She’s won the Loews Coronado Bay Surf Dog contest, the Helen Woodward Surf Dog Surf-a-Thon, Surf City Surf Dog and the Purina Pro Plan Incredible Dog Challenge. She also acts as a therapy dog. Ricochet travels around helping children gain confidence and connection. Many of her competition earnings go to charity—so far she’s raised over $438,000! When she’s not busy training, surfing or helping others, Ricochet works as a model and actor—she’s been in TV, movies, commercials and documentaries. To learn more about Ricochet, head to her very own website, Facebook page or Instagram. You can also check out a video of her story. Dozer is an English Bulldog from California whose owners took him to watch the Loews competition several years ago. A board washed up on the beach and once their pup started playing on it, he wouldn’t get off. From then on, they declared that this dog was a “surFUR”. One of Dozer’s owners, Doug, used to be a surfer but was forced to leave the sport after two cervical spine surgeries. With Dozer’s help, he has regained his love for the sport. Just when you thought this sport couldn’t get any crazier, it does! Pismo the Kid is a big wave surfing goat! Pismo’s owners taught the little kid how to surf from a young age and ever since, the four-legged farm animal has been shredding waves all over California! 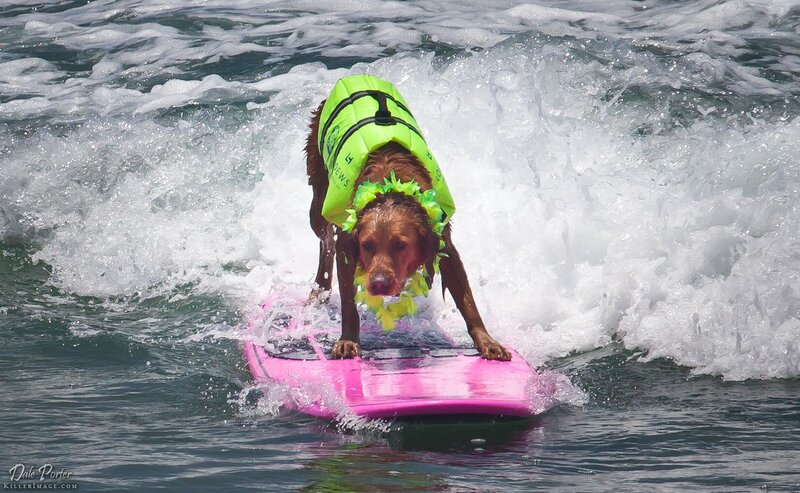 Whether you’re looking to get your dog into surfing, or spend a day on the beach with the best entertainment around, dog surfing is a spectacle you definitely can’t miss.